Since Star Wars hit theaters 35 years ago, there have been dozens of trading card sets dedicated to the franchise. 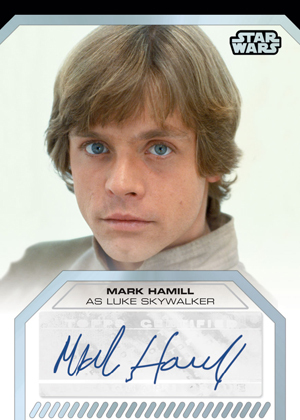 But none have quite been like 2012 Topps Star Wars Galactic Files, the largest single-series Star Wars set to date. In today's hobby, 350 cards is a decent-sized sports card set. For entertainment cards, it's almost unheard of. Until now. 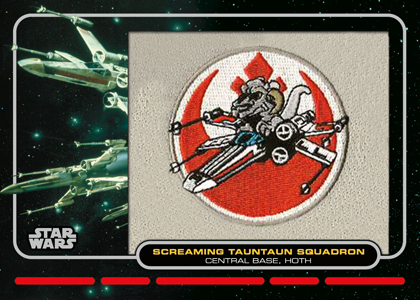 2012 Topps Star Wars Galactic Files is bringing a challenge back to set building. Spanning all six films, the Expanded Universe and the Clone Wars TV series, it's an all-encompassing set that connects the many corners of everything Star Wars. From classic characters to strange aliens to vehicles and more, this set covers a lot. Even with perfect collation, it will take collectors at least two boxes to build a set. While the checklists for the original Garbage Pail Kids and the Star Wars Galaxy lines reach far beyond that, they did so with multiple releases spanning multiple years. 2012 Topps Star Wars Galactic Files also has three parallels: Blue (#/350), Red (#/35) and Gold (1/1). Base cards are on thicker-than-normal 24 pt. card stock and have foil stamping, giving them a premium feel. 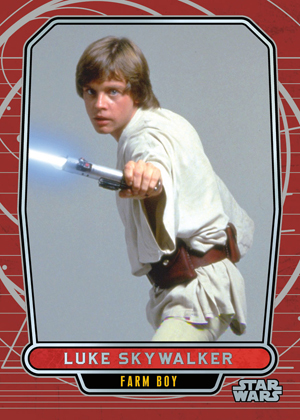 The look is similar to 2007 Topps Star Wars 30th Anniversary. Every box of 2012 Topps Star Wars Galactic Files comes with a sketch card. Even with so many out there from various other sets, Star Wars sketch cards remain some of the most popular in the hobby. As with all Star Wars sketch cards, collectors can expect a large mix of characters and styles. Boxes also promise either an Autograph or an Embroidered Patch Card. Signers are led by Harrison Ford (Han Solo). This is just his second Star Wars autograph. The first, found in the 30th Anniversary set, was extremely rare and reached highs of $10,000. Since then, Ford has appeared in other sets and prices have dropped. But that's all relative as this card will still generate a ton of buzz and high prices. Other signers include Mark Hamill (Luke Skywalker), Carrie Fisher (Princess Leia), Ray Park (Darth Maul), Peter Mayew (Chewbacca) and Amy Allen (Aayala Secura). According to Topps, Autographs and Embroidered Patch Cards are even distributed. 2012 Topps Star Wars Galactic Files reaches further into the galaxy with a mix of basic inserts. 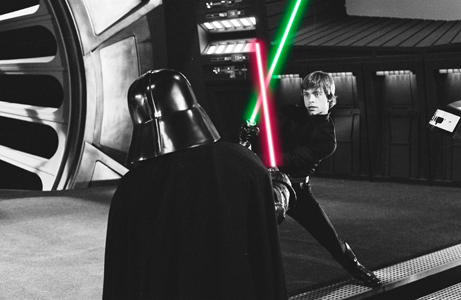 Foil Cards (20 cards, 1:6 packs) feature rare black and white photos from the original trilogy. 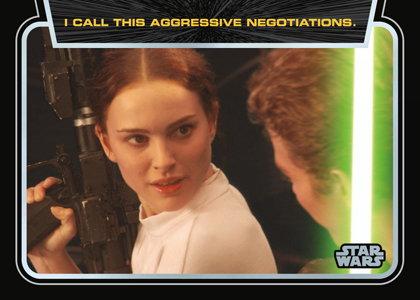 Classic Lines (10 cards, 1:4 packs) bring together some of the trilogy's most memorable quotes. But don't expect to find one such quote in the Classic Lines because it has its own insert set. 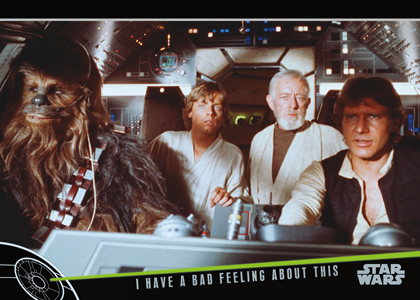 "I Have a Bad Feeling About This" (8 cards, 1:4 packs) tracks the many times the line was said throughout the theatrical films. 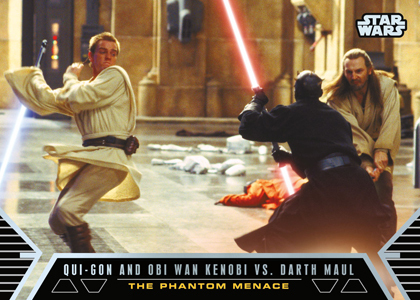 Duels of Fate (10 cards, 1:6 packs) highlights the best Lightsaber duels. 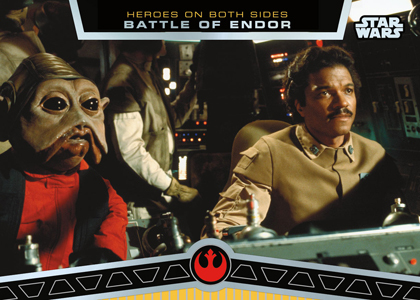 Heroes on Both Sides (10 cards, 1:6 packs) are double-sided cards that document key battles. Winners get the front while the losers are on the back. 2018 Star Wars Galactic Files Movie Poster Patch Card Lot of 5. 2 are numbered. 350 cards. Click here for short print variations info. Click here for a detail autograph guide. Inserted one per box. Cards feature original art drawn directly on the card. 10 cards. Inserted 1:4 packs. CL-1 Help me Obi-Wan Kenobi, You're my only hope. CL-2 I find your lack of faith disturbing. CL-3 Do, or do not. There is no try. CL-6 I call this aggressive negotiations. CL-7 This is where the fun begins. CL-9 I am a Jedi, like my father before me! CL-10 This deal is getting worse all the time! 20 cards. Inserted 1:6 packs. GM-16 You must learn the ways of The Force! GM-20 You were in the Rebellion!? 8 cards. Inserted 1:4 packs. Thanks for the info! I saw an ad in Previews and you gave me conformation! Not even up on Topps’ site yet. God, this is going to be a nightmare to collect! Jason (ID 64113) � I haven’t heard of any yet. That’s not to say there aren’t. I have been getting all of my packs from target and some jumbo packs from wal mart. Do any of these big box stores have the packs with the patch cards or the autograph cards in them. To date, I’ve bought about 45 random packs at Target, and haven’t seen even ONE sketch, patch, autograph card; or blue, red or gold parallel cards. Contrast that to the one SWGF hobby box I bought a while back which contained a sketch card, an autograph card and 10 blue parallel cards. My friends have had similar bad luck with SWGF Target packs, which seem to be uncharacteristically barren. At least when I bought a few dozen random “Mars Attacks Heritage” cards at various Target stores earlier this year, I got two sketch cards for my troubles. There must be many Art Cards out there. I got one a a Stormtrooper, mostly green colors, with Black Highlights. Can’t even tell who the artist is. Any help? C Mayberry � Is there something that looks like it might be a signature on it? If you can email a scan to rcracknell@cardboardconnection.com I will try to identify it. Yesterday I bought two deluxe packs at Target and came across a sketch card- it was a Stormtrooper with yellow spots. I can’t make out the name either. Robb Jacobsen � If you’re able to send a scan to rcracknell@cardbardconnection.com I’ll try my best. Just noticed that your list shows the Galactic Moments sub-series ending at #26. The check list included in a hobby box shows only 20. Could you shed some light on the last 6 in your list? Our list was provided by Topps. It looks like there are indeed only 20. Thanks for the heads up. I have a sketch card by Bill pulkovsk!, but I can’t find it anywhere on your lists. It has a blue “BP!” On the front with a sketch of a sandperson. Any clue as to where I can get value info?